I live off a dirt road that has not been graded for 3 years now. Last time it was worked a neighbor was able to bring home a blade from the company he works for. I just bought a Montana 3644HST tractor with a 6' box blade and 6' rock rake. How should I start working on the road? Besides getting the grader back in here!!!! We have rocks,washboarding and ditchs from the water running across the road. I guess my first question should of been will this Montana tractor do the job? The road is not crowned and no drainage ditch on either side. I will stop here and see what you all think about this project. Yes or No. Your tractor will do the job just fine, but I think you'd be better off starting with a 3-point mounted grader blade. You'll want to start by filling in the deep washouts so that you don't have to drive through them. After you have a good firm base to drive on, you can angle your blade by raising or lowering one of your lower lift arms. Doing that will allow only one end of your grader blade to bite. Put the low end in the ditch....or where the ditch should be......and then begin moving the gravel to the top and center of the road. Do the same on the other side of the road. Once you get a good crown formed, you'll then want to use your box blade to level the road surface and remove the dips and bumps. Leave a good crown, but don't make it too steep, as the fast moving rain water runoff will cause washouts. Rear grader blades don't work well for this job. With just a few passes down both sides, you'll begin to see a very noticeable improvement. Thanks Joel, at least it seems I am on the right road....ok not so funny. The dealer I bought the tractor from has a real heavy duty rear blade. I was going to buy the cheaper one but I think now I will bite the bullet and go with heavy unit. This road would eat the lighter blade I think in no time at all. I think you'll find that the heavier blade will do a better job, but you may still need to add some weight to it. Adjust the length of your top link to provide for the proper amount of bite on the blade. If the blade is standing verticle, you'll find that it won't cut very well. If the blade is angled too steep, you'll find that your rear tires will be pulled toward the edge of the road.....tracking straight will be a problem. Get the angle of the bite adjusted so that you can cut as much as the tractor is able to handle comfortably. Don't get discouraged. The first pass down each side is going to move very little soil. The following passes will eventually fill the entire blade. You may need to adjust the blade's bite angle with each consecutive pass. In my case, I found the third pass down each side moved a tremendous amount of gravel to the center of the drive. The progress made on the first pass was very disappointing to me. I don't want you to find yourself in that position. Let the blade do the work. If you find yourself struggling to keep the tractor straight, or the wheels are spinning and you're having to adjust the cutting depth too much....stop the tractor and adjust the cutting angle of the blade. Carry the necessary tools with you on the tractor. 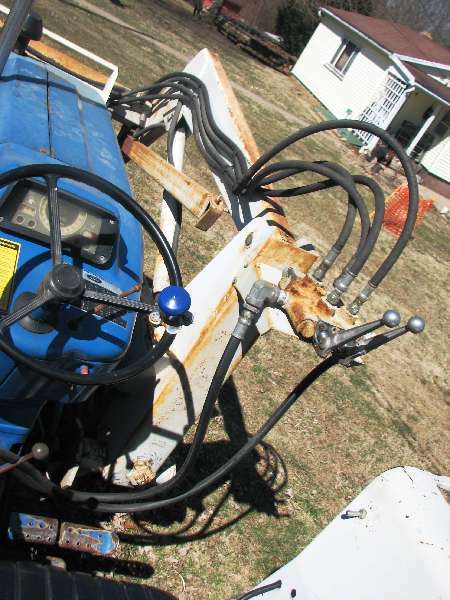 You'll be making frequent adjustments, unless you have a hydraulic top link. Also, a short-wheelbase unit with a power-up-only rear blade can't stabilize the blade like one in the middle of a long-wheelbase grader with six-way power to it. You could ask the authorities for permission to do what you want. If they accept, try it. If not, I'll bet they'll speed up their schedule to tend to that area. Take a look at an article called "A Ditch In Time". It has a lot of helpful info.This article was presented here in another thread a while back. enjoy. Auerbach, we are off the beaten path out here. The county does not grade out here at all. I would like to have a grader come out and do the job right the first time. And then maybe I could just keep it up after that. But I am looking at around $1K and that is if I can get somebody to come out here. Plus the other people on this road will not donate to the project. And most of them use the road as a race track. So I have more time than money so I will give it a shot and see what happens. Maybe I will get an "E" for effort???? Dutch, 10 years back we moved where we live. There is a dirt easement across our land. The one person who lived past it had old Cub tractor who did what he could to keep it smooth. Then I moved in with larger tractor and blade and even though all I put on it was tractor began to help work it for his benefit. Funny thing happened, came home one day and it was very obvious pro with grader had worked the "dirt easement". One day I called and asked why they were working it just wondering to which they told me they were suppose all the time. Realize a lot of that varies not only state to state but also county to county. I agree with Joel, a rear blade will work better than a box blade and also a grader will work much better than that. If you have the rear blade rotate it so your ditch end of the blade in closer to the rear wheels and lower than the other end. It is a balancing act for me but I rather cut less and have some speed so the dirt is flowing. Now I have only worked with dirt with some small gravel on it. No serious rocks. Also dry is better with dirt so it will flow or spread. Good evening KT, well the guy that put this little piece of heaven together way back when. Supposedly told the county that he did not want them grading the road. Not sure how that works but there is a big yellow sign at the entrance that says NOT COUNTY MAINTAINED one of those offical county signs you see. They grade all around us but not around here? I am going to buy the heavy duty rake blade that the dealer has and give her a try. I do not think I can hurt what is out there now that we call a road? Well maybe I can but what the heck will not be the first time I have screwed up and will not be the last!! Good morning Mitchb, wow what a great read The Ditch in Time. Thank you very much for posting it.